A coastguard tower and a Royal Navy pillbox, both part of the World War Two Hunstanton Coastal Battery (see NHER 26938). The tower was built before the outbreak of World War Two and adapted for military use during the war. It was linked to gun emplacements via a tunnel (see NHER 24939) and after the end of World War Two it returned to the coastguard. Northwest corner of coastguard lookout tower. Rectangular brick with concrete roof, like typical 'Home Guard' type of pillbox, but taller and narrower and with splayed gunslits. E. Rose (NAU), April 1987. 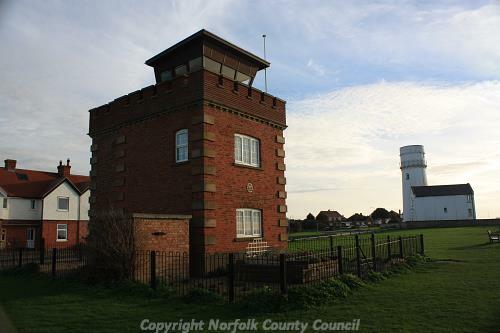 The coastguard tower itself is fortified and was formerly part of the coastal defence battery. The small defensive structure is a Royal Navy pillbox. The underground chambers at NHER 24939 were connected. See detailed report (S1) in file by . E. Rose (NLA), 4 March 1997. See record form (S1) in file by source , who adds: Unique Royal Naval pattern pillbox standing alongside coastguard tower. Dated 1940. The World War Two structures which are part of this site have been recorded under a larger number as part of NMP, NHER 26938. This site includes all the military defences, both temporary and permanent along this section of the Hunstanton coast and including the gun emplacements formerly recorded under NHER 24939. S. Massey (NMP), 18 September 2002. NGR amended from original TF 6766 4210 via GIS. M. Horlock (NLA), 12 Decmber 2002. December 2004. Norfolk Rapid Coastal Survey. Land based phase. The Royal Navy pillbox was monitored (NHER 41012 context 7). World War Two brick and concrete pillbox. Reused as a service building. See (S2). The tower was linked to gun emplacements via a tunnel (see NHER 24939). A. Hunt (NMP) states the tower pre-dates the World War Two and is marked on the 1905 Ordnance Survey map (S3). See NHER 26938 for further details. D. Robertson (NLA), 18 April 2006. Royal Observation Post at south side of lighthouse. Demolished, however outlines of the access and ventillation shafts can be seen when the grass dries out in the summer. --- Newspaper Article: 2002. Eastern Daily Press. 19 April. <S2> Unpublished Document: Robertson, D., Crawley, P., Barker, A., and Whitmore, S.. 2005. NAU Report No. 1045. Norfolk Rapid Coastal Zone Archaeological Survey. Assessment Report and Updated Project Design..
<S3> Map: Ordnance Survey. 1905. OS 2nd Edition 25 inch Sheet VI.1 (1905). <S4> Article in Serial: Catford, N.. 1999. 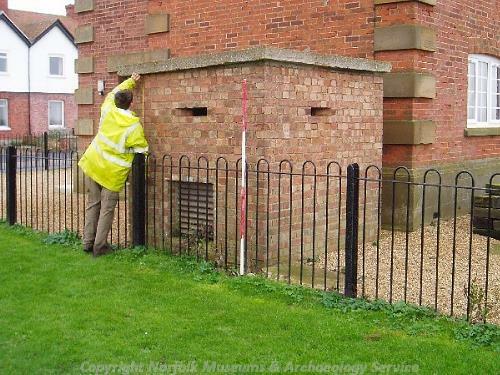 ROC Underground Posts in Norfolk.. NIAS Journal. Vol 6, No 4.